Married Ann Allred (daughter of John Allred), who was born Feb 4, 1808 and came to Utah Nov 30 1856, Edward Martin ' frozen" handcart company, died Dec 21, 1892 Their children Elizabeth b Aug: 8, 1831, d April 27, 1850, Ellen b Jan 17, 1833 m Benjamin Watts Jan 1, 1857 John b Dec 7, 1834, d Oct 30, 1840 Ann b Oct 22, 1836, m Mr Jose March 1, 1857 Mary b March 13, 1839, m William Barton Aug 23 1857 Martha b Jan 23, 1841, d same day, William b March 23 1842 m Martha Knowles April 15, 1865, John b Sept 6, 1844, d April 27, 1886, James b Aug 10, 1848, d July 13, 1850, Betsy b Jan 13, 1853, m Silas S Smith, J r , Nov 3, 1873 Family home Paragonah, Utah. 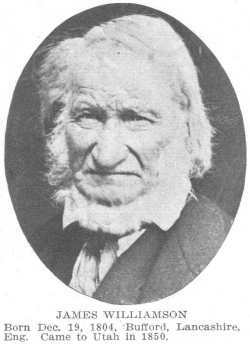 Williamson died in 1869. In September 1857, Williamson was a private in one of the Cedar City platoons in Joel White's company in Isaac Haight's 2 nd Battalion. Joel White later identified "Jimmy" Williamson as among those at Mountain Meadows. His exact role is unknown.